I managed to get some crafty time in on Sunday to play along with this week's CAS(E) this Sketch #79. I finally pulled out my NBUS Kelly Purkey, that I had to have and paid a small fortune for, washi tape for my take on the sketch. This week's sketch is partnered this week with Chaitali creator of the Iron Craft Challenge. I am also playing along with my dear friend Darnell of djkkardcreations who is hosting an awesome challenge and giveaway to celebrate reaching 500 followers! That is one very popular lady who makes all of her guests at the Playhouse feel like one of the family. I am so glad that Blogger has added the 'jump to comment form' button because it is very tiring trying scrolling to the bottom of all Darnell's comments to add a new one. Click on the link to her blog to read all about it! I mimicked the strips on the sketch with washi tape and added a NBUS die cut thanks from Lawn Fawn. Totally awesome card, Tracey!! I best get busy in my own "playroom" and join in the fun over at Darnell's blog! I am sure I have 'one or two' (*wink) NBUS!! Oh that washi tape is fabulous Tracey! Love your take on the sketch. Super fun! Great take on the sketch, love this card Tracey! Fabulous card Tracey. I love those washi tape strips and how fun that you finally busted them out. This is just awesome, Tracey! Love the colors you used!! This is so much fun...love all that pretty washi Tracey! Why do we hoard the stuff? seriously, there is so much on a roll...good for you for using your stash! How FUN is this!! Love the colors and your mix of Washi patterns. CUTE Tracey! I really like the card Tracey and it is one I would case. Washi tape is such a fun product. This is so super cute! I love the colors and the tapes you chose are so fun! Tracey...this is just too darn cute! I love all your fun Washi Tape and the bold thanks, so fun. Look at all these pretty washi patterns. Makes me want to CASE YOU! Totally Fab! Bright and Happy! 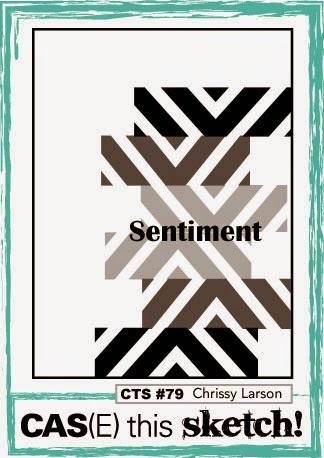 Love your choice of washi tapes on this card and the overall cuteness of it! You have style and creativity and it shows!! I didn't know what NBUS meant......hahaha...love it and love your card!! I was going to tease you about adding a "jump to comment form" on your OWN blog, lol, after scrolling down and down and down to the bottom of these, but then it opened up into a comment box like magic! And I haven't even had any wodka! Tracey, thank you so much for your heartfelt compliments and for joining in my NBUS Challenge! It's a pleasure being friends with you and I so appreciate your support and encouragement. Excellent use of the washi tape and very creative. I may have to start using that "click to jump" button for you too, Tracey! 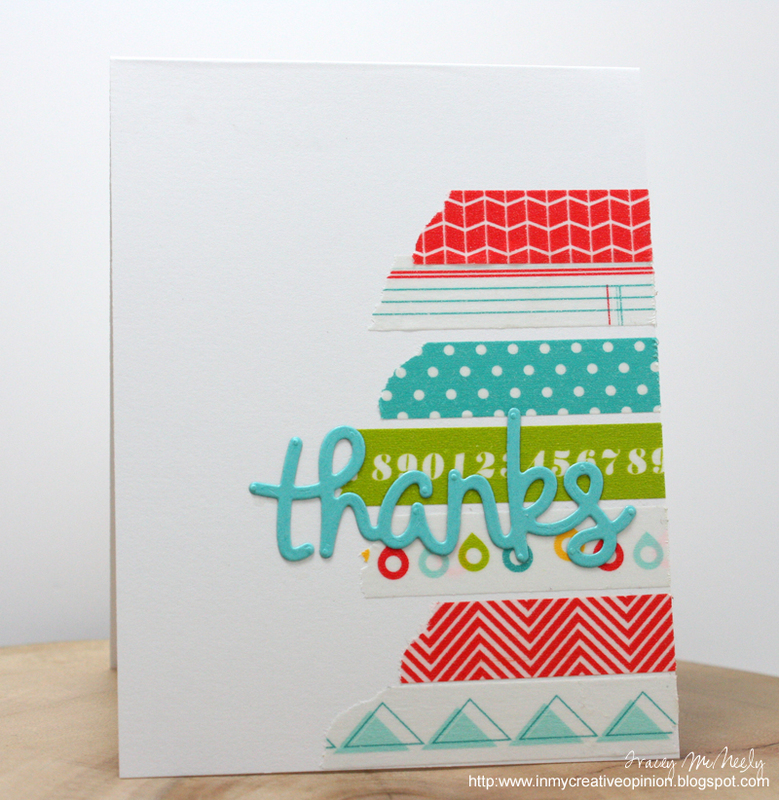 :) Love this Kelly Purkey tape - so perfect for a cheery thank you card! Thanks for playing along with CAS(E) This Sketch this week! Totally awesome approach to the sketch! Love your WT! Fun stuff! I had to use that jump to comment button for your card, Tracey. See what happens when I am a day late to your party. Love this fun washi-fest on your card. And, it is a perfect opportunity to use that sweet die cut for a sentiment. I'm going to copy this idea as soon as I get a chance--I have a couple of washi rolls around here somewhere. I pinned this card in about 2 seconds. I wash just looking at my washi tape 2 nights ago thinking I've got to figure out more ways to use this stuff. And I love this card, so the timing couldn't have been more perfect. FUN!! 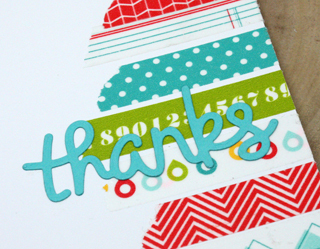 Great washi tape patterns and I love the 'thanks' die! This is a great card! I love seeing washi tape inspiration. Awesome take on the sketch, Tracey! Love that you used washi tape and that big, bold sentiment! Totally cute card Tracey! I've got tons of washi so I'm gonna CASE this fab idea!